Let’s combine two of our favorite things. No, boating isn’t one of them, although these two things go great with a day hanging out on the water. No, I’m talking about Craft Beer and Girl Scout Cookies. Yum! 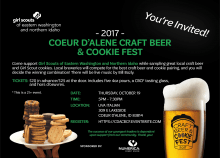 Local breweries will compete for the best cookie and beer pairing and you get to choose the winning combination! All of this is to support the Girl Scouts of Eastern Washington & Northern Idaho. The proceeds will support scholarships, camperships and leadership programs. You get to enjoy delicious craft beer paired with Thin Mints or Samonas, all while supporting young girls reach their full potential. Plus, there will be live music by Bill Bozly and hors d’oeurves from UVA Italian. It sounds like a perfect reason to ditch your diet for an evening. Check out more information at the link above.